Single-use (SU) technologies for commercial bioprocessing can provide significant benefits in terms of cost and time reduction, especially as modular approaches augment the landscape for new facility builds or existing facility updates. However, challenges to adoption remain to be addressed, which is why Pall Biotech has developed an advanced and comprehensive information management system to enable more efficient design, assembly, and implementation of SU systems and facilities. 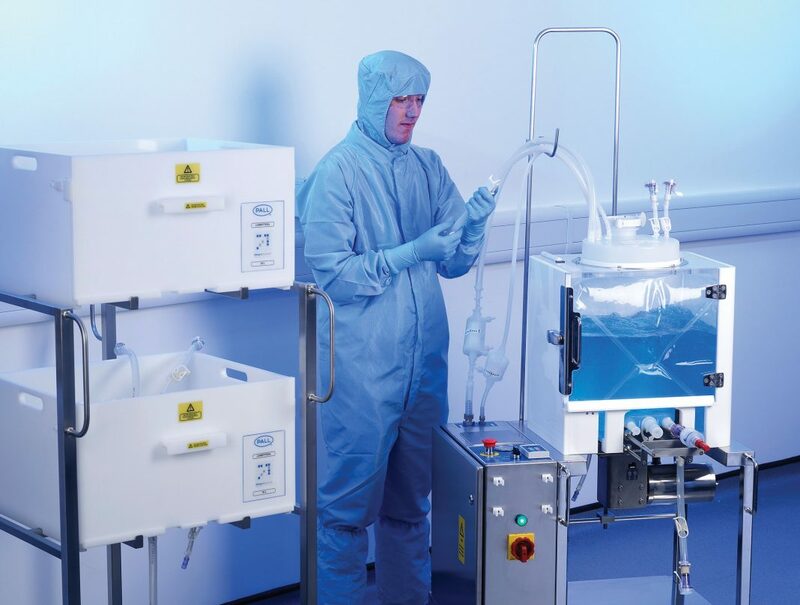 Presterilized single-use systems can reduce setup and changeover times and eliminate the costs associated with cleaning and cleaning validation. These benefits have been demonstrated in the development setting and are increasingly being realized for clinical and commercial manufacturing, particularly in new hybrid and modular facility layouts that allow users to better optimize these system benefits. Concerns remain, however, regarding assurance of quality and compliance with GMP manufacturing across the supply chain and with the potential impact of extractables on patient safety. There has been a shift to shared responsibility for quality—and therefore risk—between the end user and supplier. Addressing these concerns requires close collaboration between SU suppliers and drug product manufacturers, with clear communication regarding the requirements and expectations of both parties. Suppliers must be able to demonstrate control of their supply chains and provide assurance that SU assemblies and their components will not affect the drug product’s quality. End users and suppliers through the BioPhorum Operations Group (BPOG) and the BioProcess Systems Alliance (BPSA) have worked together to develop the Single-Use Systems User Requirements Specification (URS) Template, the Supply Chain Memo, and the Technical Diligence Document, which are tools designed to enhance communication. As a supplier, Pall Biotech has also committed to addressing end-user concerns about SU assemblies with the development of a proprietary Allegro™ Central Management System (ACMS). The dynamic information system supports Pall’s quality-by-design (QbD) approach to the development of SU assemblies from the initiation of projects and throughout their design and implementation. Data on the first SU components to be commercialized was initially maintained in Excel spreadsheets. This approach was effective when Pall was assembling a limited number of SU systems from a limited number of components. Today, however, there are thousands of components available from many different subsuppliers, and process assemblies can consist of 50 or more of these components. Using spreadsheets is not practically scalable to this level of complexity. Users are looking for an advanced information management system for the storage and use of the expanding types and quantities of data related to SU components used to manufacture SU assemblies. Since no software program on the market met the needs, a Pall team developed the proprietary ACMS solution. The first module of the system was constructed to enable storage of all information pertaining to individual components and validation of component junctions. This module was then linked to a configurator, or drawing tool, so that designers could know if the joining of two components had already been tested and if tested junctions could be used. Test requests could also be initiated if needed. In the ACMS today, components used by Pall are classified into three categories: preferred, nonpreferred, and restricted. Preferred components have been subjected to extensive evaluation and have comprehensive validation packages. Typically, junctions with many other components have also been tested. Use of preferred components, which are held in stock, in an assembly design therefore accelerates lead times. Nonpreferred components have validation packages that are sufficient to satisfy regulatory and customer requirements, but they are not as exhaustive as those for preferred components. In addition, stocks are not maintained, and thus result in longer lead times. Restricted components are typically specialized components used once for a customized assembly. The use of preferred components drives the use of components with the highest level of quality and certifications. All the information on these components is readily accessible in the ACMS system should the customer be subjected to a regulatory compliance audit. All Pall, SU assembly projects benefit from use of the ACMS, beginning with the initial customer request. The enquiry module houses customer responses provided in URS documents. Information on the customer, the desired system, the project specifications, the specific application and operating conditions (upstream, downstream, fluids, process parameters, etc. ), and other project details, such as delivery times, testing requirements, and need for prototypes, are also included in the ACMS. This information is first used in the initial review process to determine if the project enquiry can be approved. Once a project moves forward, it is used to ensure that the materials are compatible, that the assembly design is “fit for purpose,” and that the required components are or can be qualified and sourced. The information is also considered during technical and manufacturing reviews. Overall, use of the ACMS provides traceability of the approval process for all stakeholders. The design phase takes place within the ACMS as well. The drawing module, or configurator, allows generation of system drawings. It provides automatic junction verification and automatically creates a bill of materials (BOM) for each SU system design. 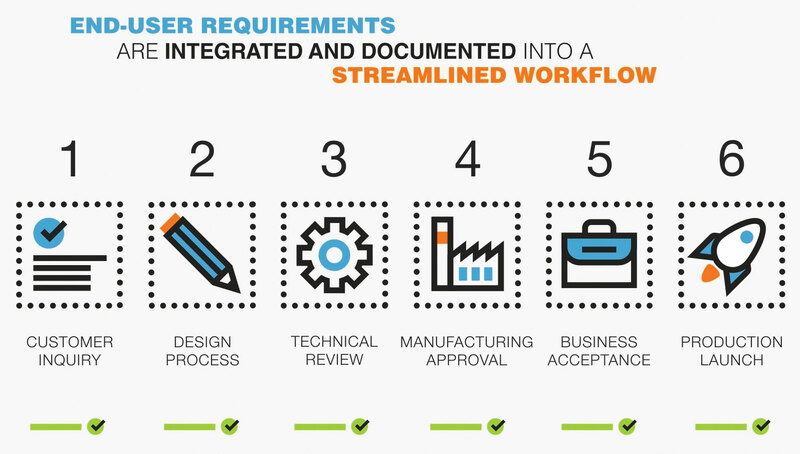 Numerous autochecks and workflows have been incorporated to ensure that projects do not move forward unless all requirements/specifications are met. No components can be used that haven’t been through Pall’s strict approval process. Only components that can operate safely under the specific process conditions can be selected. Drawings cannot be finalized and sent for customer approval until all component junctions have been confirmed to be validated. Test results for components, including pre- and poststerilization, are included. The junction test module contains all data generated during junction testing, and information is kept in one place, making it fully traceable and readily accessible. The ACMS also provides information on lead time and pricing based on the different components selected for an assembly. Access to this information allows for informative conversations with users, particularly if there is a request for specific components. Using the ACMS, it is possible to suggest other alternatives based on preferred components that meet the overall requirements but with a reduced lead time and potentially cost. The ACMS is designed with advanced search features to better facilitate the SU assembly design process for customers from many perspectives and with many end uses. In some cases, design of a new system may not even be necessary or advisable. Many biopharmaceutical manufacturers today are looking to reduce costs through equipment rationalization. With the ACMS, it is possible to search all previous designs stored in the system. Such searches can be conducted using many different criteria, enabling the identification of assemblies similar to the one currently being requested. This can streamline the design process and result in savings. This searching functionality can also be used to identify any previously designed systems or parts of systems that were initially intended for different applications but may be suitable for a new project. In this way, it efficiently leverages experience to facilitate the design process, further reducing project timelines. The ACMS houses all the standardized extractables data that Pall has been generating since 2015 using the BPOG protocols. The extractables testing program has two facets: a retrospective effort and a proactive effort. We began testing existing components with a focus on the most widely used and representative products. At the same time, we began testing all new products prior to launch. Testing begins with screening using high-resolution mass spectrometry to gain an in-depth understanding of the material composition. Extractables testing is then conducted and a technical report generated according to the BPOG guidelines. Data, including a descriptive summary (with major results, extraction parameters, and analytical and quantification methods) and detailed results for all compounds observed, is captured in the ACMS system. Results for elemental impurities analyses conducted according to the ICH Q3D guideline and Pall’s own methods are also included in the ACMS database. Furthermore, Pall is strongly encouraging suppliers of non-Pall components to provide information on extractables, specifically, data on elemental impurities. Information that is provided is extensively reviewed and, once approved, captured in the ACMS. The ACMS facilitates all steps of SU assembly projects, from initial inquiry to process design, technical review, manufacturing approval, customer acceptance, and ultimately product manufacture (Figure). The web-based system houses all component information in one location, preventing data duplication and ensuring that information is always up to date. By encouraging the use of preferred components and ensuring that all designs meet end-user specifications and validation requirements before they are submitted for approval, the system helps reduce lead times and provides enhanced reliability and robustness. The advanced searching functionality also assists customers in their rationalization efforts. By applying a QbD approach to SU assembly design and production from the start, users can accelerate access to high-quality, fit-for-purpose, single-use systems with strong documentation packages. The ability to record and search all data on SU components, junctions, and assemblies in one live system combined with a formal approval process helps to shorten timelines for the design of SU assemblies that are fit for purpose and of consistent quality, while also optimizing reliability and security of supply. The system is not a static solution—data and information management needs change as business practices and requirements evolve. As such, a dedicated team is working to further develop the ACMS system and update it through time. A roadmap is also in place for adding further functionalities to this valuable, dynamic tool. Figure. Single-use (SU) technology suppliers and end users are increasingly sharing responsibility for quality assurance and compliance with industry standards. In its collaborations with end users, Pall Biotech supports a quality-by-design approach that facilitates all steps of SU assembly projects. The approach is enabled by Pall Biotech’s Allegro™ Central Management System (ACMS). Hélène Pora, Ph.D., is vice president, technical communication and regulatory strategy, Pall Biotech.